Revisit shows you haven’t seen in years or sample shows you’ve always wanted to see. Set includes 15 episodes of Dragnet starring Jack Webb as Sgt. Joe Friday (“Just the facts, ma’am”), 18 episodes of The Beverly Hillbillies, the slapstick comedy about country bumpkins who strike it rich and move to California, and 9 episodes of the beloved TV western Bonanza. 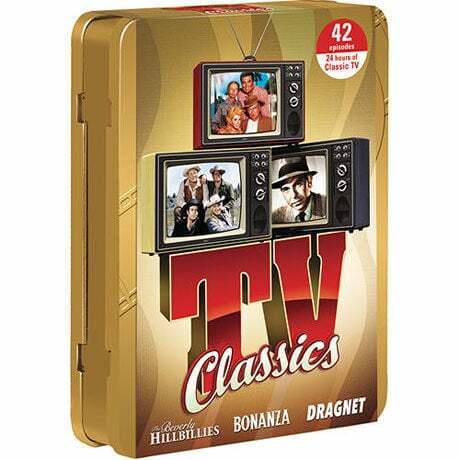 24 hrs of classic TV on 6 DVDs in a gift tin.